Mkpuru Ugu Nigerian toasted pumpkin seeds snack recipe is a familiar and easy to make African recipe to make. Boil pumpkin seeds for 8-10 minutes in salted water. Add oil to heated frying pan, drain seeds and lightly toast. Serve as a snack. Nigerian cooking utilizes the entire pumpkin plant in creating recipes. 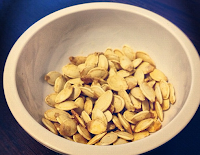 Pumpkin leaves, seeds, and the pumpkin itself make for delicious eating.